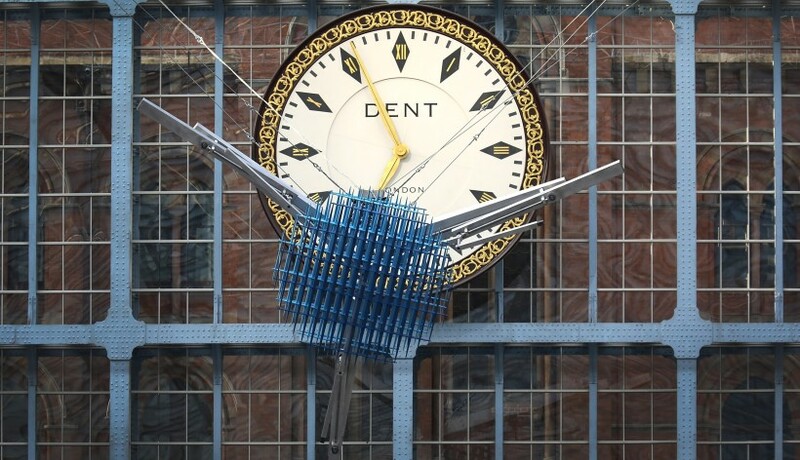 The official take on Conrad Shawcross’s new sculpture, which now hangs from the roof of St Pancras International, is that the giant rotating work, The Interpretation of Movement (a 9:8 in blue) (2017), is “a celebration of mechanics and engineering”. The latest commission in the station’s Terrace Wires public art programme is an awesome technical feat, with its three articulated arms stretching out to a 16m span and all driven by an incredibly complex gearing system. Yet although the sculpture was conceived before the UK’s referendum on withdrawing from the European Union, at the grand unveiling yesterday (22 June) Shawcross confessed that he now can’t help but view the piece in terms of Brexit. After all, it hovers directly above the Eurostar platforms—“the front is in the EU and the back faces the UK”, as he puts it. And also let’s not forget that Shawcross was one of the artists who made a significant contribution to the Build Bridges not Walls campaign a few months ago, unfurling a banner along London’s Westminster Bridge. Image: Conrad Shawcross, The Interpretation of Movement (a 9:8 in blue), 2017, Terrace Wires commission for St Pancras International. Photo: Tim Whitby/Getty Images for HS1.